Starting off the week, economist Kate Bahn and computational social scientist Austin Clemens analyzed the data from the most recent release of the Job Openings and Labor Turnover Survey (commonly known as JOLTS) by the U.S. Bureau of Labor Statistics. In short, the data substantiate a tightening labor market with hiring, firing, and other labor market flows largely restored to their pre-recession levels—despite persistent inequalities across demographic groups. Responding to another federal data release, Clemens also commented on the U.S. Census Bureau’s report on “Income and Poverty in the United States for the year 2017.” Specifically, he contends that the Census Bureau’s disaggregation of data by age, gender, race, region, and other characteristics should serve as a model for other government agencies to produce data that more accurately reflects how Americans across the country are experiencing the economy. 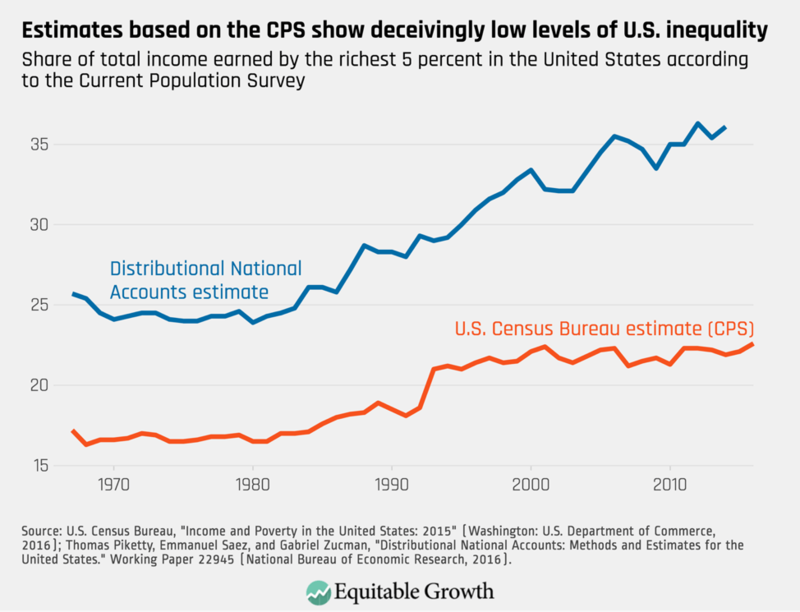 Nevertheless, given the declining representativeness of survey data, he also advocates for increased use of administrative data from the Internal Revenue Service to more accurately track rising income inequality. In his weekly “Worthy Reads” blog post, economist Brad Delong reviewed recent work by Equitable Growth, including my blog on a paper by Equitable Growth grantees and economists at University of California, Berkeley on the positive earnings effects and negligible employment effects of local increases in the minimum wages. Among other work, Brad also highlights an interactive by the Economic Policy Institute on income inequality across states as well as interesting work by economist and Equitable Growth Research Advisory Board member Sandy Darity and by historian Caitlin Rosenthal on the long-term economic impacts of slavery on the modern U.S. economy. Closing out the week, research assistant Raksha Kopparam followed up on a comment Equitable Growth submitted to the Federal Trade Commission about its recent action against Your Therapy Source, LLC for anticompetitive wage-setting practices. In her blog, Kopparam summarizes recent academic research documenting the growth of monopsony power in the U.S. economy as well as its negative impact on workers’ wages and market competition. John Cassidy focuses in on the meager middle class income gains revealed by the U.S. Census Bureau’s data release earlier this week. While growth in median household incomes has picked up since 2014, the gains have been modest, barely offsetting the large losses experienced by working and middle class families during the Great Recession. Since incomes for these families were also stagnant before the Recession, Cassidy points out that the richest households experienced 9.3 percent income growth between 2000 and 2017 whereas low- and middle-income households saw losses from 2 percent to 4 percent. Criticizing the relevance of the economic data the government makes available, David Leonhardt echoes an argument frequently made by Equitable Growth Chief Economist Heather Boushey and computational social scientist Austin Clemens. In particular, Leonhardt notes that while stock values and GDP growth have increased in the past few years, the income and net worth of most families have remained stagnant. Similarly, while unemployment rates are down, a larger number of workers has stopped looking for jobs, thus exiting the labor force. Concentrating on the microeconomic causes of rising inequality, Andrew Van Dam and Heather Long describe the changes that have taken places in six industries that once offered above-average wages in the 1990s but currently pay their workers below-average wages. These industries are motion picture and sound recording, warehousing and storage, food manufacturing, motor vehicle and parts dealers, repair and maintenance, and wood products. While each industry has dealt with its own challenges, workers across these industries have been negatively affected by deunionization, globalization, technological changes, and economic insecurity. Turning to the implications of these changes across generations, Paul Kiernan summarizes the results of a study by sociologist Michael Hout on the relationship between the occupational choices of children and those of their parents. Hout finds that only half of Americans born in the 1980s landed better job opportunities than their parents compared to two thirds of Americans born in the 1940s. Kiernan argues these findings are consistent with research by Equitable Growth grantee and former Steering Committee member Raj Chetty that show the proportion of children earning more than their parents declined from 90 percent to 50 percent over the same time period.